Successfully Added Touch Screen DVD Player - 1-Din 7 Inch TFT Screen -SECAM Tuner to your Shopping Cart. Single Din DVD Player with a pop out 7 Inch sharp TFT with touchscreen ability. 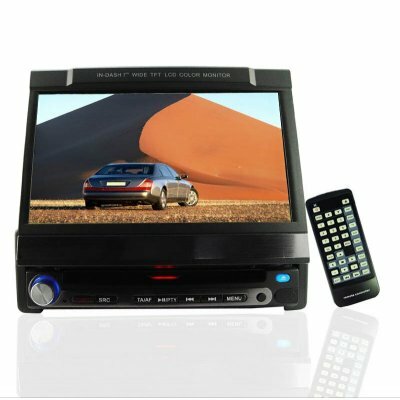 For such a small and easy to install Car DVD Player you will be getting a lot of great features including a USB for playing MP3 songs, super sound capacity with 4 x 45 Output and Dolby Surround DTS/ Dolby Logic II, and a built in analog PAL/SECAM TV Tuner. This new and improved version now includes Bluetooth, CD changer control and two subwoofer preouts left and right. For such a low wholesale price that Chinavasion can offer, you can definitely afford to really pump up your cars abilities, and with wholesale discounts available, buying in bulk means that you can make a great profit in resale. Note: The TV tuner included in this product is not compatible with the NTSC colour system.